Payment Card Industry Data Security Standard (PCI DSS) compliance is a defacto requirement for all organizations that store, process, or transmit any type of payment card data. The PCI DSS was implemented to ensure payment card data is secure and to prevent credit card fraud. Being PCI compliant is crucial for business as any drop from the high security standards could result in fines, penalties, or even restrict your ability to process payment cards in the future. 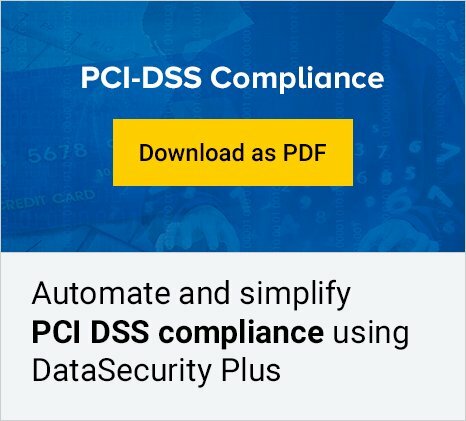 DataSecurity Plus is a compliance tool that helps solve the challenge of complying with the PCI regulatory mandate. DataSecurity Plus generates a variety of reports for you to analyze privilege escalation, verify legitimate access requirements, and much more. In addition to these reports, the preconfigured alerts help detect and respond to potential threats instantaneously, limiting the extent and scope of damage. Below is a list of reports you can use to prove that your organization is PCI compliant.